The person/people which have claimed responsibility for this bundle of burnings against targets in and around Bristol refer to themselves as the Informal Anarchist Federation/Earth Liberation Front (no relation to the International Anarchist Federation, which has publicly asked that they rename themselves to something which doesn’t risk getting non-participants harassed) and have been active for several years in the area. They have been known to comment on Bristol Indymedia, which acts as an open media platform for the local movement, as part of their campaign. Whoever is behind it has consistently showed up police, their most famous action seeing the destruction of a firearms range in May which led to them becoming a national news item. The Daily Mail leapt on the story, deciding it was probably an individual who they distastefully dubbed the "Bristol Unabomber," and hammered the police for not making an arrest. In June police chiefs duly appeased Mail editor Paul Dacre by picking up a 32-year-old man in connection with the actions, though as Class War blogger Ian Bone noted at the time, the almost immediate release on bail of their supposed main suspect was somewhat puzzling, given the crime. The arsons however continued, with the IAF/ELF claiming responsibility for a string of attcks on Glebe Road on July 1st and denying any connection to the arrested man. So this is the background to the situation. A humiliated police force under pressure from an influential paper is looking for a way to get itself out of a hole. And to do so it’s making it impossible for an independent news site that has regularly criticised it to keep going. I considered putting this up as a news article, but I think it's important that the broader issues at hand be spelled out. This is a case of the police force using its radically-extended online powers to deny a media organisation the right to protect its sources and contributors. The equivalent in newspaper terms would be a raid seizing the contacts of every journalist on staff - something that would have every media organisation on the planet decrying what would rightly be called a State attack on free speech. Some of the most important journalism ever undertaken has involved protecting sources (journalists have gone to jail to protest this principle), and while there the police have the legal right to demand specific sources in the cause of national security or preventing crime, this is step change from seizing every single contact and potentially the names of every critic of the force. This Bristol server invasion is just the latest episode in an ongoing expansion of the concept of “terror” (which is the fundamental driver behind otherwise ludicrous comparisons of arsons against empty properties to the deliberately fatal letterbomb attacks attributed to Ted Kaczynsky) to embrace all forms of effective dissent and justify chilling State interventions against any group deemed to be linked, even tangentially, to political direct action. Regardless of any personal feelings about the use of arson as a political weapon by small cells*, police should not have the leeway to simply demand open access to the files of any media group. Even in liberal parlance this is a direct path to malpractice and the evisceration of the fourth estate, with a rampant thin blue line doing whatever it wants then citing operational need whenever it fancies silencing its critics. In more radical circles, this is another proof of a creed which should by now be second nature – put nothing online that you either don’t mind being linked to, or can be 100% sure won’t be traced. 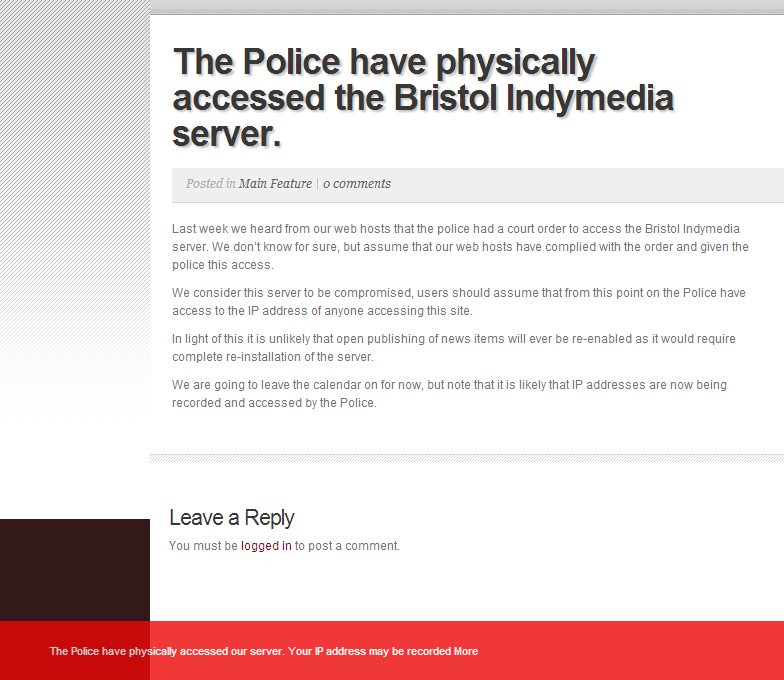 It sounds like Bristol Indymedia weren't storing IP addresses, so previous users should be okay, I think. In general it'd be good practice to hide your IP using a proxy or VPN if you really must post online about something illegal (or don't post at all, preferably). Small correction - IFA/IAF is the International *of* Anarchist Federations, rather than the Internatiinal Anarchist Federation. 1. Bristol Indymedia remains online although the newswire is presently closed, whilst other parts of the site operate. The (very) small collective remaining are apparently considering opening up the newswire again, on the basis that any users will know that it is now insecure for sure. It has also come to light that the cops also had a warrant to open up the email account of one of the B/Indy mods, this email account used the same server as B/Indy, and was purely for admin purposes. 2. On Mon 22 Sept, BBC1, 7.30pm, weekly regional news documentary 'Inside Out Points West' started with a 10minute slot all about the arsons & other attacks claimed by the IAF/ELF etc etc. It noted 20+ claims or attacks over 3 years, and focused on 3 specific ones in an attempt to demonstrate that those claiming the attacks were genuine ie had done it - by comparing technical info contained in the communiques with reports from cops/fire brigade. 2 of the attacks looked at were the burning down of the under-construction firearms centre, and an arson attack on a Barclays bank. The programme also included a short interview with a former US ELF spokesman (in the 90's) who now runs a bookshop in the US, who concluded that these 20+ attacks were consistent with the attitudes of people who may 'belong' to the ELF!? The local Bristol Cop, Andy Bevan, leading the investigations, was at pains to bracket all these attacks as 'domestic extremism', but not quite (or yet) as terrorism. This programme was preceeded by articles on the BBC Bristol webpage, and followed by typical hysterical rants in local Tory rag the Bristol Post - who cover most such attacks in their rag. the national Independent newspaper also picked up the story on 23 Sept, with a headline that claimed the US ELF guy was in effect claiming all the attacks as by the ELF. The background info for these news articles, and indeed the Mail online article quoted above, almost certainly comes from an A4 folded handout distributed around the radical milieu by persons unknown (I saw a copy on the free info table at the 2014 Bristol anarchist bookfair in late April), that claims 50+ attacks over the last 3 years. Its the 2nd such handout I've come across, the first dealing with previous years. No doubt both have been made available online on the insurrectionary sites. So we are not dealing with any clever investigative journalism here...One presumes the Mail article was probably planted by Special Branch or similar to whip up a bit of a storm...? 3. Arrests & harassment - of more immediate concern is the increase in numbers of arrests and home visist to known activists recently. Police claim to have made some 6 arrests, but at worst individuals are on police bail, most have been released without charge. Perhaps 5 of those arrested have been traced by local activists. Of these perhaps the most serious was the arrest of a former Bristol resident on a 2 week visit to the country, staying with friends/activists, who was arrested at their house at 7am on his last day here. His arrest was followed less than an hour later by a seach under warrant of the property, with some items removed. No charges followed, and the individual arrested has now had his bail dropped, and was in any case allowed to leave the UK. Others arrested appear to have literally been in the wrong place at the right time by accident, some suffered heavy-duty searches. Some may well sue the cops. Home visits have also been conducted to some dozen or more known local activists, all involved in public-facing campaigns/projects/groups. Visits have usually been by 2 cops asking for a chat. Prior to the seizure of the B/Indy server, the purpose of the visits seems to have been an attampt to locate the people behind Bristol Indymedia, and were unsuccessful (it seems). Since the seizure, visits have focused more on asking about a Huw Norfolk (aka Badger), a Bristol activist who went on the run after leaving identifying evidence behind whilst smashing the windows of the Bristol Post (then Evening Post) in the summer of 2011, due to the Post's collusion with cops in identifying individuals wanted for participation in the Tesco riots of April 2011 ie printing fotos. His whereabouts naturally are unknown, and there has been nor will there be co-operation with the cops from those receiving visits. In addition at least 4 known Bristol activists have been stopped on re-entering the UK after trips abroad and questionned under anti-terror legislation. 3 of these happened 1-2 years ago, but 1 occurred in early September when a person formerly involved in B/Indy was stopped with his partner when returning from a holiday in Berlin - all info/files on their laptop, phones, camera were copied. This person has complained to his MP and taken legal advice. Its worth noting none of those arrested or visited are believed to face any evidence at all linking them in any way with the actions of the IAF/ELF, indeed some are probably opposed outright to such tactics. Some have been invited to contact local cops for further chats and/or have been asked outright to grass, an offer rigourously rejected of course. It would seem that in the absence of any leads, cops are conducting some sort of mapping/phishing exercise of the local movement, perhaps in the hope of scaring someone into saying something foolish or incriminating themselves in some way...even when they actually have no useful info to give! However in the absence of the real culprits, it wouldnt be the first time the cops found someone else to take the rap, and a very nasty rap it will be! Cops could also be builing some sort of conspiracy case..? Last December the local Bristol AF produced a useful anti-harassment piece following a spate of harassment (see http://bristolaf.wordpress.com/2013/12/05/taking-a-stand-against-police-harassment/). It would be no surprise to see a wider campaign emerge around this issue soon, clearly it is urgently needed. In the midst of a period of intensified police harassment of some anarchists & other radicals in & around Bristol, the Bristol Defendant Solidarity project and numerous other groups have issued a statement of defiance, mixing support & solidarity for those who need it, with legal advice & rights info. Here's an excerpt: "These home visits, arrests, searches and requests to snitch are not just about information and evidence gathering. They have as much to do with a concerted effort to intimidate and divide us all. A big part of their plan is to scare people into inaction and to create divisions between us. They hope to get us blaming each other for increased surveillance to the point where someone falls for their lies and starts talking to the bad guys. These are tactics that have been used against social movements in countless places and times."